Inclusive Publishing readers can get 10% off tickets to ebookcraft and Tech Forum 2019, March 18-19 in Toronto, by using the promo code DAISY10. Take a look at the schedule to see the lineup so far and watch out for DAISY sessions which will be announced soon. The last day for early-bird pricing is Jan. 25 and registration closes on March 12. See the ebookcraft events page for further details and book your place now! Ebookcraft – An Excellent Adventure Indeed! This blog piece was kindly written by Romain Deltour, lead software developer for the recently released EPUB accessibility checking tool Ace by DAISY. Romain delivered a workshop at ebookcraft entitled: Is Your EPUB Accessible: Put it to the Test. This image is one of Romain’s slides used during his workshop. 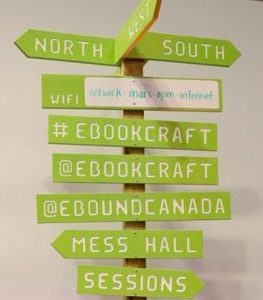 Last month, on March 21 and 22, while the lovely Toronto was still hesitating between staying firmly in winter or boldly entering spring, I attended ebookcraft, a two-day conference on ebook production. I have followed previous ebookcraft conferences remotely via twitter, and been told several times by friends and colleagues that this event was an amazing experience, so when I was invited to speak about accessibility testing on the workshop day, I was thrilled. And well, ebookcraft didn’t disappoint. It was a fantastic conference. From the inclusivity guidelines in the speakers’ guide, to the pronoun stickers attendees could put on their badges, you knew that the awesome Lauren Stewart and the BookNet Canada team were serious about organizing an inclusive event. This welcoming atmosphere no doubt helped the attendees and speakers to feel at home and made us enjoy, all the more, the very interesting presentations, round-tables, and corridor discussions. Among the various topics in these exchanges, accessibility was perhaps the most often cited subject. I was very happy, in particular, that the leading efforts of the DAISY Consortium to help make digital publications accessible to everyone were unanimously acknowledged. Despite the technical challenges, the enthusiasm of ebook developers and publishers to make born-accessible publications was tangible. Ebookcraft was all about learning and sharing; when it comes to inclusivity and making information truly accessible to everyone, this feels very heartwarming. There have been a number of excellent event reports written since the conference and we have listed those that we have found here below. Booknet Canada has already provided access to the slides from the conference, once again increasing inclusion in this ground-breaking event. For many of us who work with ebooks, the highlight of our year is ebookcraft in Toronto…. Why do we love ebookcraft? It’s full of “practical tips and forward-thinking inspiration.” It’s impeccably organized, by the wizardly Lauren Stewart and her team. It’s warm and welcoming. There are cookies. More than half the speakers are women. It really is about making beautiful, accessible ebooks. Of course, that requires standards. The ebook world has suffered more than most, with interoperability being a dream rather than a reality. As more schools, libraries, and governments set a11y requirements, it is important to understand why a11y features matter and how to implement them in digital publishing. A Booknet Canada blog piece by Kira Harkonen listing conference resources including slides, you tube videos of presentations, links to articles, a round up of conference tweets and information on next year’s event. If we get it right, ebooks can combine with any technology, ereader or assistive technologies, to enshrine content not in dead tree sheets but in machine-readable, universally accessible, deathless code. This news piece by Porter Anderson, Editor in Chief of Publishing Perspectives highlights the winner of the So You Think You Can Code competition held every year at ebookcraft. This year’s winner, Houghton Mifflin Harcourt’s Katy Mastrocola, used Ace by DAISY to check the accessibility of her entry. Getting ‘aesthetically pleasing and accessible content’ out of what the judges gave her as a mashup of sci-fi and Lewis Carroll, Katy Mastrocola beats the competition. Hats off to Laura Brady and the rest of the ebookcraft steering committee – we can’t wait till next year! https://inclusivepublishing.org/wp-content/uploads/2018/04/30415239_2429277367098338_5597974284424138078_n-1.jpg 371 325 Sarah Hilderley https://inclusivepublishing.org/wp-content/uploads/2017/10/logotype-sized-for-web.png Sarah Hilderley2018-04-05 14:53:042018-04-16 18:37:02Ebookcraft - An Excellent Adventure Indeed!